Titan (or Saturn VI) was discovered by Huygens in 1655. Its period of revolution is 16 days. 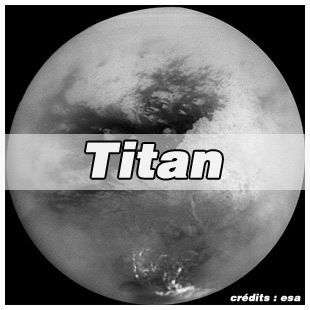 Titan has an opaque atmosphere that prevents the ground from being seen. The atmospheric pressure on the ground is probably 1.5 bars (1.5 times the atmospheric pressure at sea level on Earth). The Huygens probe landed on its surface on 14 January 2005. It took exceptional photographs making it possible to penetrate the secrets of this Saturn satellite.